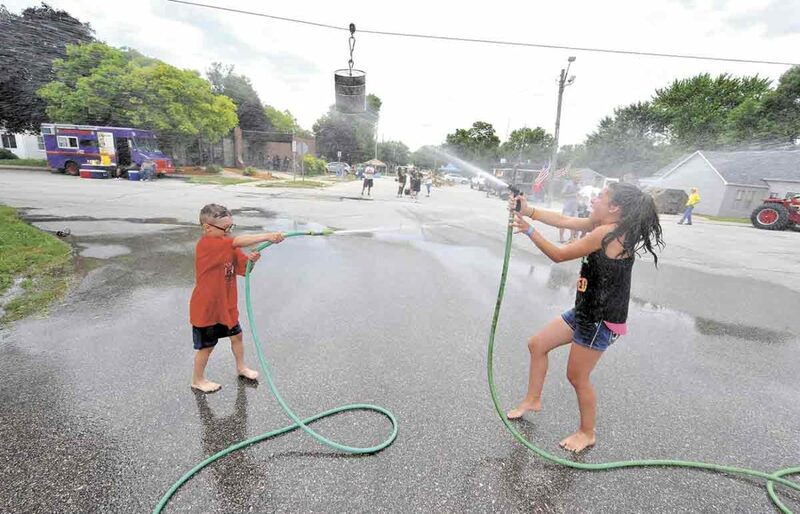 Madden Bailey, 8, of Badger, at left, uses the old “spray them in the face” trick during his water fight battle with Kadence Johnson, 11, of Badger during the Children’s Water Fights at the annual Badgerfest in 2017. The event was hosted by the Badger Fire Department. 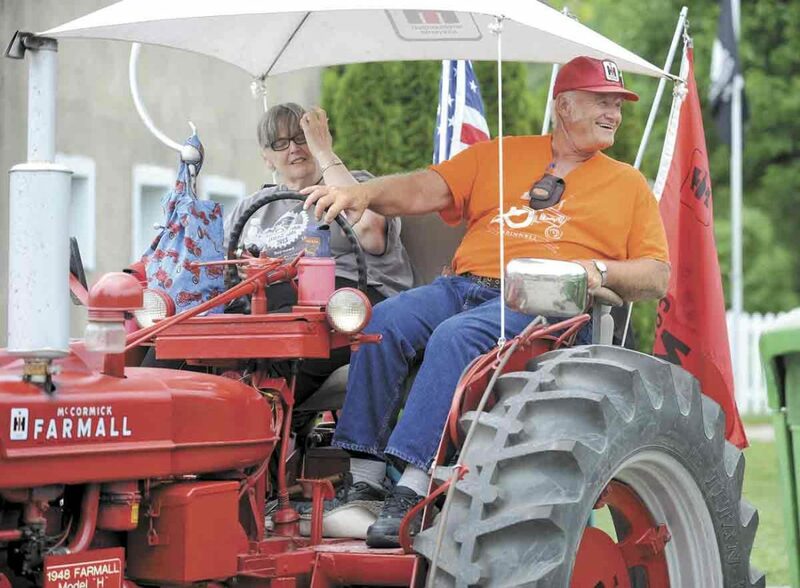 BADGER — Memories of carrying a banner for the Badger Public Library as a kid during the Badgerfest parade and later watching adults try to climb a greased pole with a $100 bill at the top always stuck with Mandy Gascho. So when she found out Badgerfest was not going to continue a few years back, she wanted to change that. Gascho decided to volunteer her time to help save the celebration. Badgerfest made a comeback in 2014 after a 10-year hiatus and has continued to grow in recent years, according to Gascho. The fun this year will start with the coronation of Little Mr. and Mrs. Badgerfest. The crowning will take place on the town’s main street, First Avenue Southeast, at 9:30 a.m. on Saturday. From 10 a.m. to 4 p.m. a vendor fair will be held on Second Street Southeast. Gascho said there will be at least 45 different vendors there. At 10:45 a.m., a VFW salute will be held at the city’s Veterans Memorial at the Badger Fire Station. A variety of kids games will take place in and around the Badger Public Library. Kids games will require a $5 bracelet to participate. Bouncy house, cake walk, bunnies, face painting, dunk tank, a climbing wall, and seek ‘n find, will be offered. 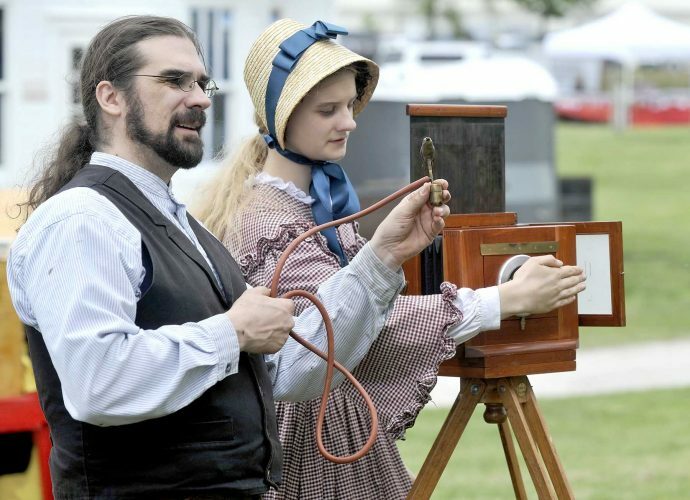 From 1 p.m. to 1:30 p.m., Larry Dunbar will perform his magic. Also during that time, the water fights will be held in front of the Badger Fire Station. At 3 p.m., attendees will have the opportunity to try and catch a greased pig at the city’s baseball diamond. Whoever catches the pig will earn a trophy. Car and motorcycle show registration will start at 4 p.m., along with Badger Bacon Bash. The Badger Bacon Bash is a competition among bacon enthusiasts, Gascho said. Contestants are asked to invent a dish that includes bacon. The dishes need to be served in sample sizes. The crowd will vote on “most creative,” “tastiest,” and “most baconlicious.” The winner of the contest will receive a trophy. From 5 p.m. to 8 p.m. the car and motorcycle show will be held along the First Avenue Southeast. The Beaver Creek Band will perform at that time. This year’s celebration will also hold a raffle to help Gascho’s brother-in-law, Adam Gascho. Adam Gascho was involved in a car crash in Fort Dodge in April. He is still recovering from the accident, she said. A raffle for Adam Gascho will be held starting at 5 p.m. The Broken Keys, a band from Des Moines, will rock main street during the street dance from 8 p.m. to midnight to conclude Badgerfest. Gascho said each year, Badgerfest is improving. 5 p.m. to 8 p.m. car/motorcycle show, Beaver Creek Band, Raffle for Adam Gascho, on main street.